The BJP has rejected reports that “one-rank-one-pension” (OROP) scheme was among the issues discussed at the much-watched-out samanvay (coordination) meeting between senior RSS and BJP functionaries that began today. However, sources say concerns were raised by senior sangh leaders on the issue and its effect on the party’s image, even if on the sidelines of the main event. After listening to the government's side, they also advised a quick resolution to the impasse to avoid damage to the party’s image. Refuting speculations, BJP general secretary Ram Madhav called as “baseless and false” the reports of OROP and Ram Mandir being on the agenda for the meeting. “Ram Mandir and OROP was not a matter of discussion today, and any report saying that it happened is absolutely false. OROP is a government policy and its implementation is a government matter,” Madhav said on the first day of the meeting that was watched keenly by Opposition parties. The three-day coordination meeting called by BJP’s ideological fountainhead RSS is to "exchange notes" among sangh affiliates on relevant social and economic issues. While both BJP and RSS deny it, the meeting is also being seen as a “review” of the Narendra Modi government’s 15 months in power. This, even as Madhav today, and before him RSS chief spokesperson Manmohan Vaidya, maintained that the meeting was not designed to discuss government’s performance, but discuss matters such as national security, agricultural growth and social issues. Opposition parties such as AAP have called the meeting between top BJP ministers and the RSS and its 15 affiliates a “mockery of Constitution”, an “interference” in political process and indication of sangh’s growing interest and involvement in governance. Taking a dig at the RSS, former Jammu and Kashmir Chief Minister Omar Abdullah questioned how it could be called a social organisation. “So, the RSS is doing a three-day performance appraisal of the Modi government. Anyone else wants to tell me that they are a social organisation?” Omar tweeted. According to a BJP leader, while OROP could be discussed in the meeting in the coming two days, it was not a part of the agenda for the day. 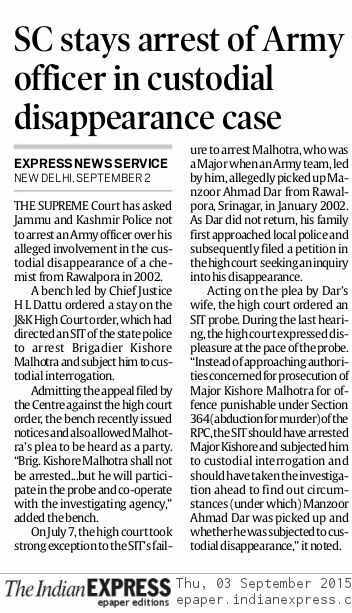 On the sidelines though, senior RSS leaders like Suresh Bhaiyaji Joshi and Dattatrey Hosabale expressed apprehensions about the issue with Defence Minister Manohar Parrikar and Home Minister Rajnath Singh. RSS chief Mohan Bahgwat also talked to Finance Minister Arun Jaitley and Parrikar separately on the issue and sought to know the problems the government was facing in its implementation. Sources said all organisations affiliated to the RSS today gave their feedback on major initiatives of different ministries. The event was inaugurated by Sarsanghchalak Mohan Bhagwat, who highlighted the relevance of the word “samanyay”, saying “taal mel” (coordination) was required among different affiliates of the sangh parivaar. “He said a difference of opinion can result in ‘katuta’ (unpleasantness) and the aim of the meeting was to remove any difference of opinion, any communication gap, on various issues," sources said. Apart from Rajnath Singh, Jaitley and Parrikar, BJP chief Amit Shah, Foreign Minister Sushma Swaraj, Transport Minister Nitin Gadkari, Urban Development Minister Venkaiah Naidu and Health Minister JP Nadda were present there. PM Narendra Modi is expected to attend the meet on Friday. ON both sides of the India-Pakistan border, columns were written after the aborted National Security Advisers’ meeting. Most retired Indian diplomats and analysts argued that flip-flops on Pakistan betrayed the absence of coherence and strategy. Journalist-apologists of the government dismissed these as laments of those without post-retirement sinecures — a familiar approach, commonly used by twitter “trolls”, to attack the person rather than his argument. In Pakistan, retired diplomats reflected known proclivities ranging from India-baiting by Munir Akram to balanced analysis by former high commissioner to India, Ashraf J Qazi, or rare brutal self-examination by Husain Haqqani, victimised by the Pakistan military when posted as the Pakistan ambassador to the US. Haqqani reminded Pakistan that the last resolution by the UN Security Council on Kashmir was in 1957 and that today it would be impossible to get any support for a fresh resolution for plebiscite in Kashmir. His sage advice is that Pakistan should stop living in the past, trapped in a Kashmir-is-ours narrative, while India too must not rub Pakistan’s “nose in the ground”. The Modi government has undertaken two cycles of PM-level India-Pakistan engagement culminating in bickering and last-minute cancellation of scheduled meetings, i.e. Foreign Secretary-level meeting in August last year and now those of the NSAs a year later. The government’s defenders aver that this is actually calculated relaying of new red-lines. This claim needs examination. The first red-line is strict bilateralism, implying Pakistan would not provocatively consult Hurriyat before high-level talks. The second one is that India-Pakistan parleys will first focus on terror. 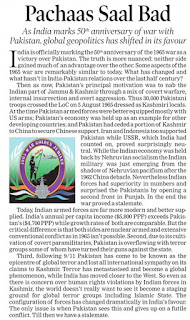 Once India is satisfied of Pakistani cooperation, the old composite dialogue, or any new variant, may be revived. Pakistan’s de facto foreign minister Sartaj Aziz told Indian television that as a politician, if he met Indian Prime Minister on the sidelines of his talks with NSA Ajit Doval, he could not be constrained to only discuss terror without enquiring about “modalities” to resume dispute resolution. Sartaj Aziz’s argument carries weight as such specificity can be prescribed if the meeting was of Additional Secretaries heading the Anti-Terror Mechanism, as the writer did in 2006-07. It could also be if the Home Secretaries of the two countries met. Once talks are ramped up to the political level, the discussions perforce will be wider. In the Ufa statement, the words that “all issues connected to terrorism” will be discussed left a loophole for Pakistan to introduce Kashmir, as according to them it is the root cause of terror. The two other operative parts of the Ufa joint statement relate to confidence-building measures for maintaining peace at the Line of Control/International Border and the release of fishermen. Regarding the first, progress depends on Pakistan army’s cooperation, which uses ceasefire violations to convey unhappiness over its own government’s India policy or to facilitate infiltration or simply defy perceived Indian dominance. The recurring fishermen issue is a factor of unresolved maritime boundary due to the non-settlement of the Sir Creek issue. The tripod on which the Pakistan polity rests is the army, political parties and radical Islamic groupings - political or jehadi. A decade of Pakistan playing the US counter-terrorism game in the Af-Pak area has complicated relationships amongst the three. Some former jehadi protégés have turned enemies of the Pakistan state while others have diversified their own lateral links to Afghan/Al-Qaeda groups. The Death of Taliban leader Mullah Omar will exacerbate the jostling for space amongst the entire jehadi fraternity, further complicated by the ISIS seeking adherents. What then should be the Indian strategy to deal with this complex and evolving situation? 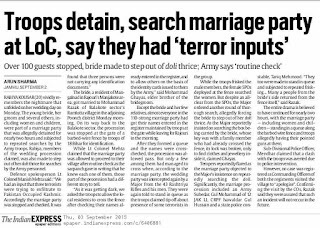 BJP/RSS spokesmen on television hint at a Doval doctrine of retribution. One even claimed that the Indian NSA has warned Pakistan that it would lose Baluchistan if there is another 26/11. Such rash statements are providing Pakistan ammunition to prove Indian meddling, which globally none has so far taken seriously. It also neutralises Indian moral advantage built over decades, alleging Pakistan’s complicity in abetting terror in India. Contrariwise following can be the contours of India’s Pakistan policy. Firstly, India must not push Pakistan’s elected government, however ineffective in controlling their army, into the army-jehadi corner. It is in India’s long-term interest to have any elected government be less and not more dependent on that combine. Secondly, Pakistan’s Punjab is losing mental space to the trans-Indus jehadi/Wahhabi hybrid of Islam which is alien to centuries of diverse and inclusive Islamic precept and practice. 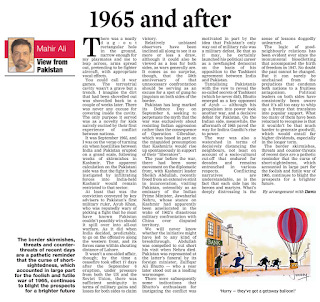 De-radicalisation in Pakistan would need the Punjabi heartland to rediscover its historic roots, which it shares with Indian Punjab. Bangladesh, under PM Sheikh Hasina, is combating radicalisation by rooting itself in the composite Bengali culture and not by espousing an anti-India Islamic construct. For this, it is necessary to revive incrementally cultural, travel and youth links between the two Punjabs — through which ran ancient arteries linking Central and South Asia. Maharaja Ranjit Singh — first indigenous ruler since Rajput rule (647-1192) to govern Punjab (1799-1839) — wove a Muslim majority area with a significant Hindu and Sikh population into a Punjabi citadel of composite culture against Pashtun interference from trans-Indus regions. Sikh troops hunted down Syed Ahmad, self-proclaimed Amir ul-Momineen, a title that Taliban leader Mullah Omar assumed, in 1831 at the Battle of Balakot. Thirdly, the Composite Dialogue, conceived in 1997 in Male by Prime Ministers Nawaz Sharif and IK Gujral, is flawed as confidence-building measures (CBMs) and disputes are tackled simultaneously. Pakistan holds back progress on CBMs to force progress on Kashmir, Siachen, etc. This is absurd as CBMs are meant to create the environment for dispute resolution and must precede the latter. Special representatives must be appointed to deal with disputes, out of public view, via a back channel. Meanwhile, the Foreign Secretaries/Ministers can quickly finalise CBMs that are mature for delivery. Terror issues can be handed over to the intelligence chiefs of the two nations. September-end, the two PMs will be in New York. They have an opportunity to break the logjam. PM Nawaz Sharif must refrain from playing to the international gallery. 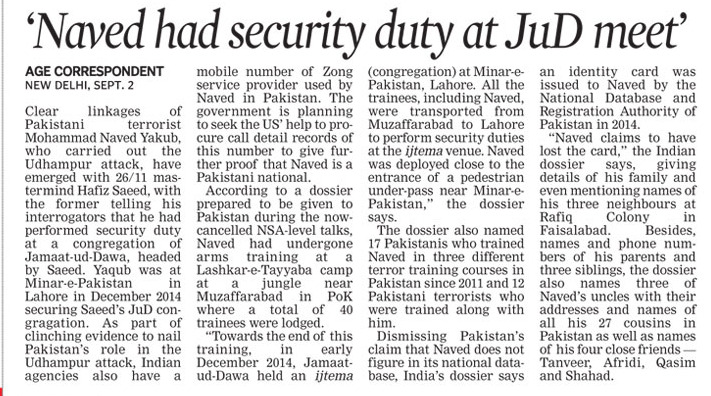 PM Modi needs to retrieve his Pakistan policy from the intelligence-security lobby for a safer South Asia. India will mark a low-key presence at China’s military parade that may see the unveiling of the vastly upgraded armaments to counter the US-Japanese threat. Parading of the East Wind ‘carrier-killer’ missile is a message to India’s hawkish set of strategists about the primacy of diplomacy to better ties with China. Today is a rare public holiday in China to allow the broad participation of its citizens in a parade celebrating the 70th anniversary of Japan's formal surrender on September 2, 1945, after the atomic bombing of Hiroshima and Nagasaki that marked the end of World War II. India will mark a low-level presence in junior Minister V.K. Singh, with no participation by an Indian Army column. This is in contrast to the May 8, Victory Day parade in Moscow where a smartly turned out contingent of the Grenadiers marched down the Red Square while President Pranab Mukherjee shared the podium with Russian President Vladimir Putin, UN Secretary-General Ban ki-Moon and other Presidents and Prime Ministers who turned up despite a western boycott protesting the continuing civil war in Ukraine. As many as 17 foreign army contingents will march past the heart of Beijing but the cynosure of every strategic eye will be a secret weapon China has kept under wraps for five years. This is the East Wind missile that threatens to upset the suzerainty of American aircraft carriers around the Chinese coastline. It can also hit the three American military bases at Guam, five hours away by air from Hongkong, and till now considered out of reach for Chinese weaponry. China's expected admission of this “(Aircraft) carrier killer” missile sends a message about its military readiness to the US-led alliance attempting to checkmate its influence in South China Sea and the Sea of Japan. The message should also be noted in New Delhi as India is struggling with its version of an intercontinental missile. The showcasing of the missile in Beijing also underlines its military disparity with China. 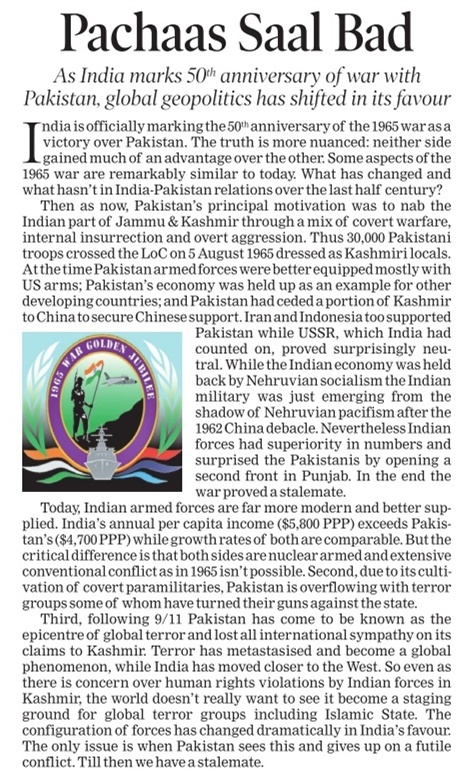 The stark disparity in military preparedness is in synch with the economic gulf between the two countries — China's annual gross domestic product has remained five times larger than that of India. China is pulling out all stops to ensure the focus is firmly on the parade, from clearing the skies of birds and clouds to shutting down its currently volatile Shanghai stock exchange. Unlike Moscow, why did India then opt for a token presence in Beijing? The reason may lie in the official name of the public holiday: The 70th anniversary of Chinese People's Anti-Japanese War and the World Anti-Fascist War Victory Commemoration Day. In other words, the event's focal point will be Japan's wartime legacy — the deaths of over a crore Chinese in the its eight years of occupation topped by the Nanjing massacre that killed up to three lakh, the large-scale abduction of women for the pleasure of the Japanese army and forced labour all over China and South East Asia. The Japanese have already flagged their displeasure over UN Secretary-General's attendance at the parade, a criticism that has been answered by the invitee himself. “It is important to look to the past, what kinds of lessons we have been learning, and how we can move ahead to a brighter future based on the lessons learned. That is the main purpose,” Mr Ban explained. The crucial point, however, is China viewing Japan as the American surrogate in the region which has been mustering the might of other nations for “collective self defence” against it. 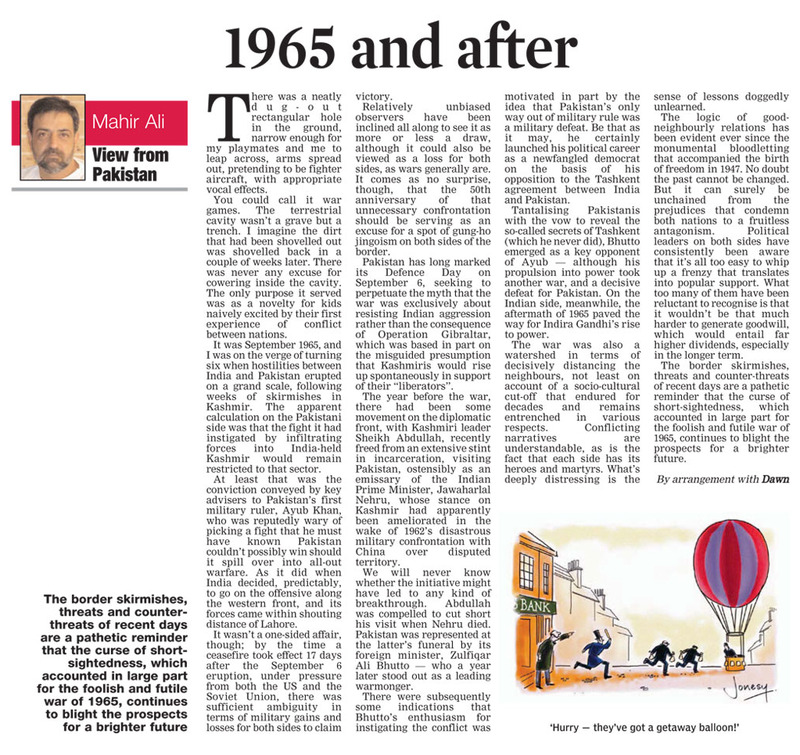 Till the regime changed in Delhi, India remained sympathetic to China's apprehension about a ring of belligerent nations trying to box it within its national boundaries. It never held a trilateral naval exercise involving Japan and the US after its maiden attempt in 2007 drew Chinese ire. It chose to step up diplomatic engagement while simultaneously making the Line of Actual Control (LAC) with China more impregnable. Just as the military parade concludes in Beijing, Indian Navy planners will be putting the finishing touches on a joint naval exercise with Australia. 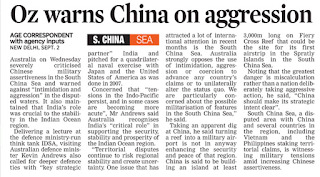 Days later, Japan will be invited to join the traditional Indo-US Malabar naval exercises amidst commentaries that after eight years of trepidation, India is once again enthusiastic about expanding this show of strength in the Asia Pacific to also include Australia in the near future. 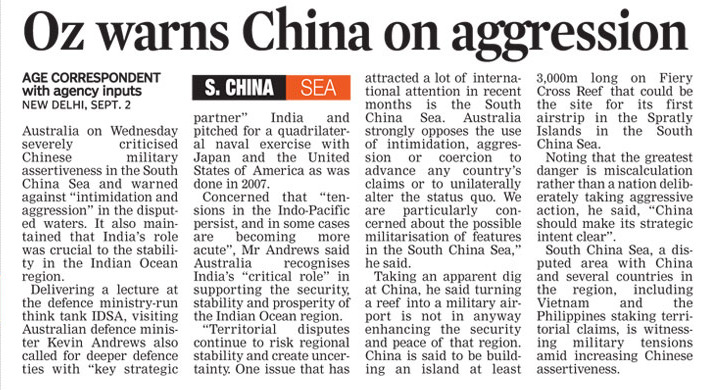 Elsewhere too, India is fast-tracking plans for a Japan-US-India initiative to check Beijing's influence among the South-East Asian nations girding China's southern underbelly. As the Chinese race to drop north-south communication links into Malaysia, Thailand, Laos and Cambodia, the trio is putting in place an east-west transport artery that could checkmate these plans. Level-headed economists have already done a sobering reality check on the gloating in India over China's economic troubles. India's undeveloped infrastructure and the several impediments over doing business, to mention two, are inadequate for both countries to swap places in the world economic hierarchy. The economic literature coming out of China hardly ever mentions India as a worthy competitor in economic growth and exports. India's higher GDP growth rates in the next few years will not lead to it suddenly becoming economically more powerful than China. China need not trumpet the obvious difference in economic clout with India. It is competing with the US for the top slot among the comity of nations and has already displaced Japan. The message from the parade in Beijing is on the same lines. China has set its military sights much higher and is preparing to achieve parity in destructive potential with the US and any other ally that might wish to join forces. The unveiling of the missile is thus a sobering wake-up call for the section of India's strategic planners plotting to pressurise China with military alliances. While India must refurbish its military, there is no other alternative to better ties with China other than diplomatic engagement that has already earned the promise of billions of dollars in investment, ensured a largely tranquil border and enabled a partnership on, challenging the discrimination practised by the Bretton Woods institutions. The government is likely to notify the ‘One Rank, One Pension’ (OROP) scheme, but as per its own definition. This could possibly include a compensation for soldiers retiring before age of 40 and a fixed tenure for revision of pensions to equalise them as per ranks and years of service. It will take into account the very basic criteria that the pensioners get compensated for having “sticking their neck out” for defending the country and don’t feel let down. 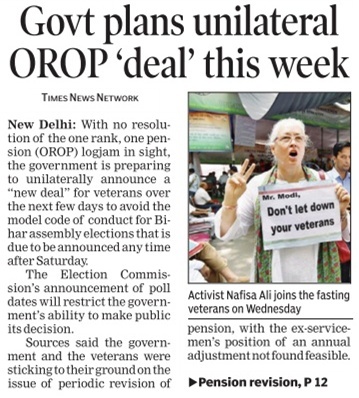 The Bihar Assembly elections are also driving the government to finalise the OROP. Today another meeting was held on the matter to bridge the gaps. The government formula was listed out by Finance Minister Arun Jaitley two days ago when he laid down a few ground rules for implementing the OROP, a pre-poll promise made down the BJP. He ruled out any annual pension revision. 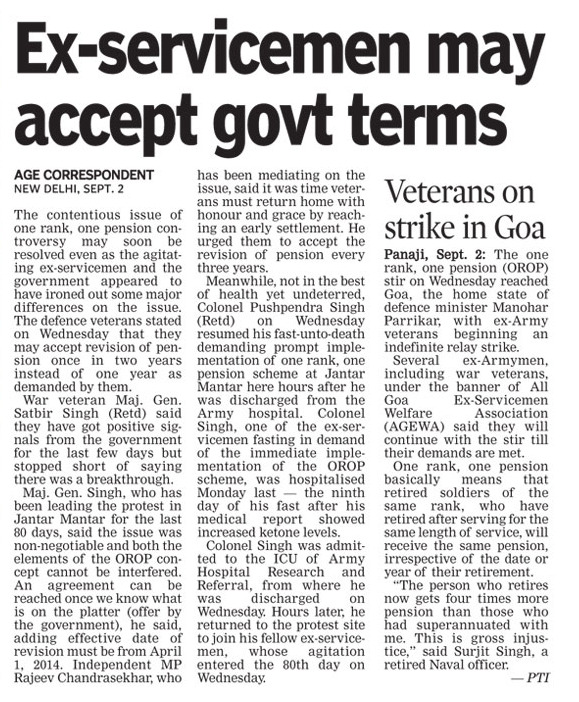 In the talks between the government and the ex-servicemen, the government had proposed that the hike in pensions — to make them equal for same rank and same length of service — would be done once in five years. 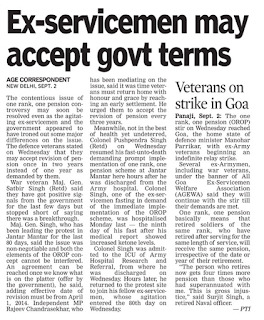 The Indian Ex-Servicemen Movement (IESM) at first agreed for a biennial (once in two years) equalising of pensions, but later withdrew the concession and demanded an annual equalisation. But indications are that a middle path may be worked out on tenure for revision of pensions. 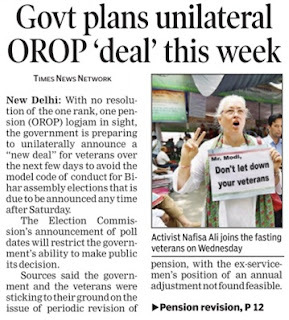 Sources said the Government has made its best offer to the veterans and wants to tread a path that does not open a pandora’s box with similar OROP-type demands from other services like paramilitaries. The system of equalising the pension is crucial as the OROP entails same pension for all those who retired in the same rank with equal length of service. 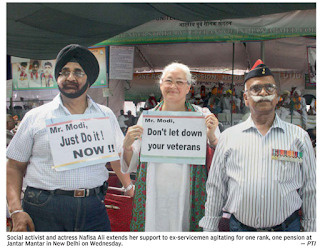 Ex-servicemen sitting in Dharna have been asking for the OROP without dilution of the recommendations made by the Bhagat Singh Koshyari Committee. Koshyari, who headed the Rajya Sabha Petitions Committee, said in December 2011: “Uniform pension be paid to armed forces personnel retiring in the same rank with the same length of service, irrespective of their date of retirement, and any future enhancement in the rates of pension be automatically passed on to the old pensioners”. A soldier of the Army’s elite counter insurgency unit and a top militant of the newly formed Lashkar-e-Islam (LeI), which carried out attacks on the telecom infrastructure in May and June this year, was killed and two jawans were injured in an eight-hour firefight in north Kashmir on Wednesday. A sepoy of the 32 Rashtriya Rifles, Sishar Malla of Dehradun, was killed during the gunfight after the security forces launched an assault this afternoon to storm the two-storied house in a congested village, where militant Reyaz Ahmed Bhat, alias Rizwan, 25, of Brahat Kalan in Sopore was hiding and giving a tough fight. Rizwan was killed after the house was blasted by the security forces. The police said the gunfight erupted this morning in the Ladoora apple belt of Rafiabad in Baramulla district, 55 km from here, when the Special Operations Group of the J&K Police and the 32 Rashtriya Rifles launched a search operation following a tip-off about the presence of a militant in the area. “As the joint teams of the police and the Army launched search operation, the trapped militant fired at the security forces triggering an encounter,” said Deputy Inspector General of Police, north Kashmir, Gareeb Das. “In the firefight, a militant associated with Lashkar-e-Islam was killed and we also lost a jawan,” he added. 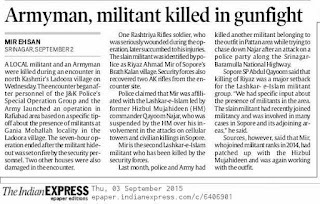 Sources said two Army men also received minor injuries in the gunfight. 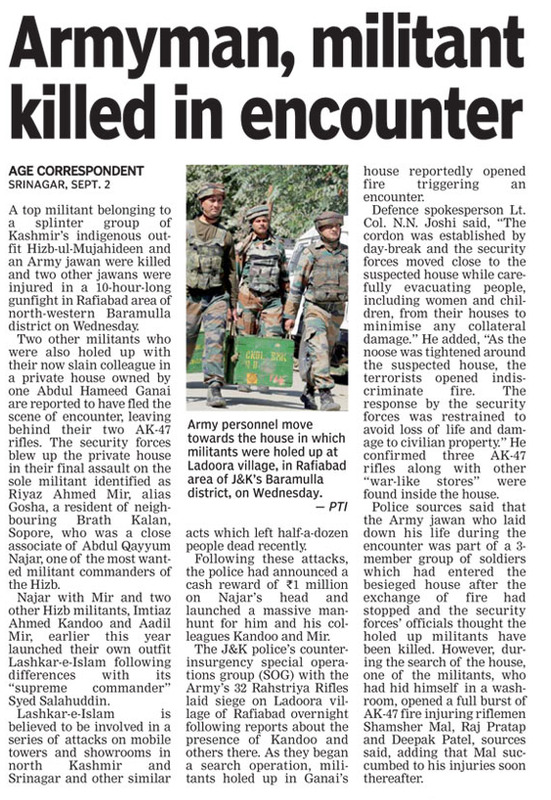 The security forces had a tough time flushing out the lone militant from the two-storied house and the militant managed to engage the security men for nearly eight hours. 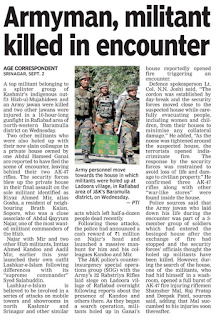 “We had to evacuate the inhabitants from the house, where the militant was hiding and we went slowly to ensure that there was no civilian causality,” said an Army officer in north Kashmir. He said the Army jawan who was killed in the gunfight was hit by the bullet on the forehead. An AK-47 rifle and some ammunition were also recovered from the encounter site. The Lashkar-e-Islam, which is led by one of the most wanted militants in Kashmir Abdul Qayoom Najar, is a breakaway faction of the Hizbul Mujahideen. Police sources said Rizwan was number three in the hierarchy after Najar and Imtiyaz Qandoo. Both Najar and Imtiyaz carry an award of Rs 10 lakh each. The LeI carried out a series of attacks on telecom infrastructure in north Kashmir. 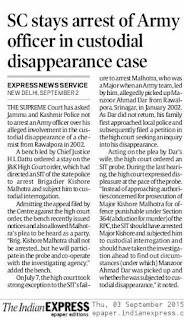 The police said Rizwan had joined militancy in April 2014 and was involved in various violent incidents, including killing of civilians in Sopore in June this year. 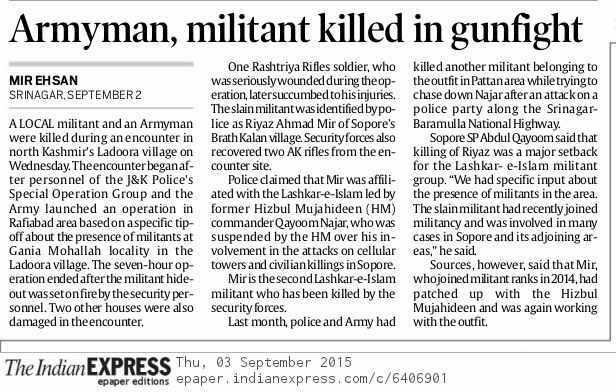 This was the second encounter in Rafiabad in the past one week. On August 26, three Pakistani militants were killed and one Pakistani intruder was captured in the Rafiabad forest. India and Australia on Wednesday agreed that maritime security should remain a key component of their defence relationship and decided to hold army-to-army talks on annual basis. Australian Defence Minister Kevin Andrews, who is on a four-day visit to India, held talks with his Indian counterpart Manohar Parrikar in New Delhi. According to a defence ministry release, the meeting between Andrews and Parrikar was followed by a delegation-level talks to discuss issues of shared strategic interest and the current state of the bilateral defence relationship between the two countries. The two sides issued a joint statement which said that the first navy-to-navy bilateral maritime exercise will be held later this month. "The exercise will involve multiple ship visits and maritime assets from both the countries and will foster greater interoperability and cooperation between both nations and further contribute to maritime security," the statement said. It said India and Australia have held defence policy talks and bilateral army, navy and air force staff talks since the last defence ministers' meeting. "To further bolster this good progress, it was agreed that the ministerial level meeting may continue to be held regularly while the army to army talks would now be held on annual basis," the statement said. The two sides decided that Royal Australian Navy will participate in the Indian Navy International Fleet Review in February 2016 and bilateral maritime exercise will continue on a biennial basis. They also decided to establish a joint working group on defence research and material cooperation, closer air force engagement including Indian attendance at the Royal Australian Air Force exercise 'PITCH BLACK'. They also agreed to creation of a closer Counter-Improvised Explosive Device (CIED) relationship, commencing with a regular subject matter expert exchange. The two sides will also have increased air force cooperation on aviation safety and air worthiness. The two ministers acknowledged the progress made during the past year in bilateral defence cooperation and underscored their ongoing interest in fostering and maintaining peace and stability in the Indo-Pacific region. The ministers also discussed the centenary of the First World War and recalled the contribution made by the Indian and ANZAC (Australian and New Zealand Army Corps) forces during the Gallipoli campaign. The ministers affirmed their desire to deepen the bilateral defence relationship based on shared strategic interests and to implement the action plan outlined in the Framework for Security Cooperation agreed to by Prime Ministers Narendra Modi and Tony Abbott in November last year. "Given both nations' interest in the Indian Ocean and its vital importance to regional and global trade, the ministers acknowledged the importance of freedom of maritime navigation and agreed that maritime security should remain a key component of the bilateral defence relationship," the statement said. It said Australia and India will also continue to cooperate through joint work as part of the ASEAN Defence Ministers' Meeting Plus construct. The statement said that defence science and technology organizations and the Defence Research and Development Organization would continue to explore opportunities to identify areas for cooperation. The release said the ministers agreed that implementing the new initiatives would strengthen the robust defence relationship and their long-term objective was to develop a significant defence and security relationship. "This will be important as we respond to shared challenges and work together to ensure a secure and stable region," the release said. The Australian defence minister had called on Prime Minister Narendra Modi on Tuesday. Defence ministry sources said that seven types of ammunition have been identified for procurement from private suppliers as part of ‘Make in India’. The armed forces currently source specialist ammunition either from Ordnance Factories Board (OFB) or through imports. The defence ministry has, for the first time, mooted a proposal to allow private manufacturers to produce specialist ammunition for the army. The proposal, worth around Rs 800 crore, is now waiting for the decision on the number of years for which a firm commitment will be given to the private supplier. The armed forces currently source specialist ammunition either from Ordnance Factories Board (OFB) or through imports. As per the CAG report placed in Parliament in May, OFB had failed to supply the army with the targeted quantity, leading to shortfalls in supplying up to 73 per cent of the total types of ammunition. Moreover, in imports, no procurement of ammunition took place against the nine items initiated for procurement through capital route from 2008 to 2013. CAG had also warned that as of March 2013, half of the 170 types of ammunition held would not last 10 days of war fighting, a “critical” situation, and 74 per cent were not enough for 20 days of war fighting. As per policy, army is supposed to maintain its ammunition reserves for 40 days of intense war fighting, with 20 days reserves being ‘Minimum Acceptable Risk Level’. Defence ministry sources said that seven types of ammunition have been identified for procurement from private suppliers as part of ‘Make in India’. This includes specialist ammunition for tanks and artillery guns, GRAD BM-21 charges and electronic fuses; none of them are currently not being manufactured in India. At the hearing on the CAG report with the Parliamentary Accounts Committee in June, the ministry had assured the MPs that barring one item, they are confident of overcoming “critical” level for all types of ammunition by 2016. That assurance was based on the plans to get private suppliers to produce these critical types of ammunition. “This will create another indigenous source of specialist ammunition for us, over and above ordnance factories and import route. 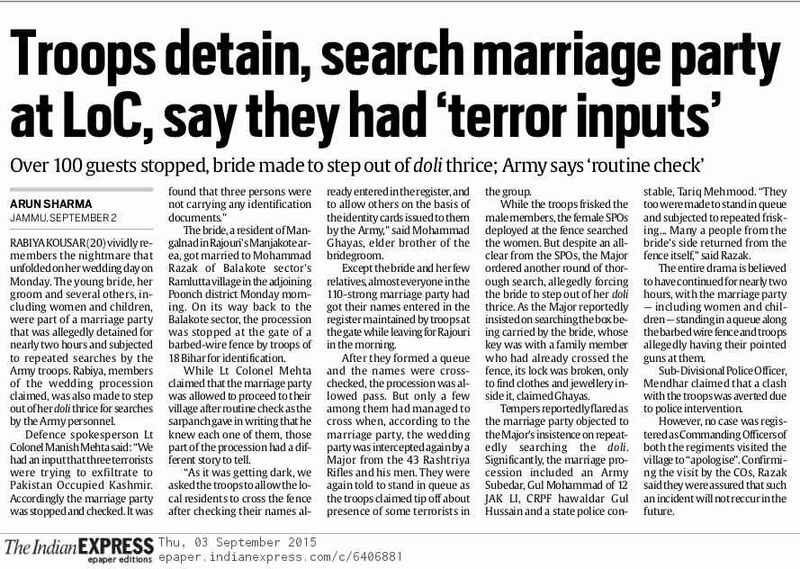 It will help us quickly make up critical deficiencies,” said a defence ministry official. At least four private firms have expressed interest in producing specialist ammunition in India and are awaiting the issue of RFI. But the proposal has been delayed because private suppliers will need a long-term commitment – of around five years — from the defence ministry to set up production.